Last year EverQuest II dipped its toes in free-to-play waters splitting its services into two separate games: The regular EverQuest II, and the limited free-to-play EverQuest II Extended. Next month the game puts that silliness behind it and dives in head-first. They're calling it "free-to-play your way", a fancy way of indicating that Sony Online Entertainment is finally ready to proudly stand beside the other former subscription-only MMO titles that now make up the majority of the market. I had a chance to speak with EverQuest II executive producer Dave Georgeson about the new program and the game's next expansion pack, Age of Discovery, earlier this week. "If you boil it way down, all we're really doing is making it a lot easier for people to pay however it is they want to pay," Georgeson began. "That's the whole point of this conversion. We still have recurring subscriptions, those are still available, but there's also non-recurring subscriptions, which are new to the MMO industry as far as I know...and we've simplified the membership matrix alot, so that we can make this as easy for people to understand as possible." I've gone ahead an attached the new membership matrix here. Aside from combining the two different players bases into one, the main changes are that the Bronze level from EQII Extended has been renamed Free, the Platinum level is going away, and the Gold level will enjoy new benefits, including access to all classes and races it was formerly denied. One class that won't be available for free is the Beastlord, making its EverQuest II debut in the Age of Discovery expansion next month. Along with the pet-friendly class, the expansion also brings a unique new dungeon builder feature, in which players collect random pieces and hero characters from monster drops and construct their own deathtraps, ready for other players to explore and rate. It sounds a bit like City of Heroes' Architect feature, only instead of the players themselves running through the adventure, they'll take on the roles of legendary EverQuest heroes, villains, and creatures instead. "It's very easy to make a customized experience that nobody else has ever seen before," said Georgeson. Players will be able to place monster spawners, define AI behaivors, and, in phase two, litter their dungeons with traps for the unwary. While the new expansion pack will run players $39.99, the majority of what EverQuest II has to offer goes free next month. That includes the entire game and all expansions up to and including Sentinel's Fate. Limitations on completely free players remains rather severe, but hey, free is free, and free your way sounds even better. "All we're really trying to do is letting people decide what they want to do, when they want to do it." Sounds fair to me. 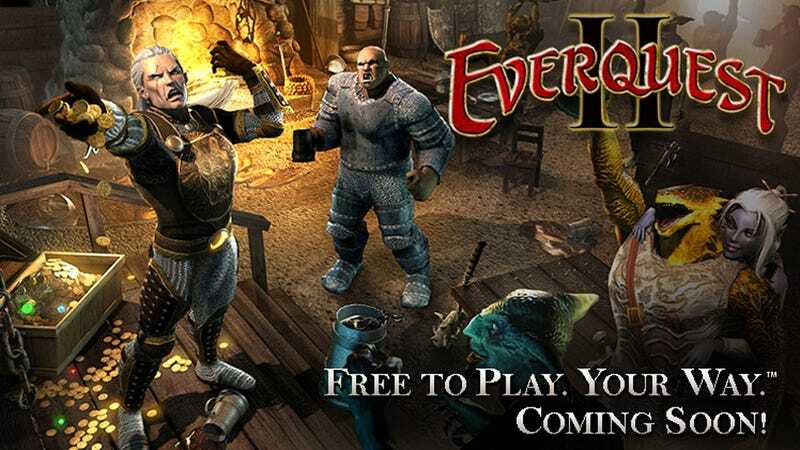 Hit up the EverQuest II Free-to-Play FAQ for more information.